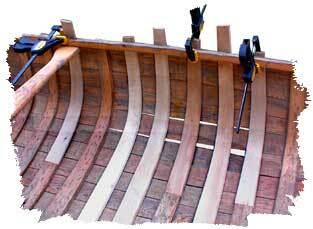 Have you found an old neglected beauty that needs extensive rebuilding or have a favourite canoe that just needs a bit of touching up? We can handle the job. Our repairs are done with care and attention to detail to ensure a quality job. We use only high quality wood which we produce ourselves on our own bandsaw mill. All screws, tacks, and bolts are either brass, silicon bronze or stainless steel. We use quality Epifanes on our bright work and on the covering. We can recover canoes with traditional cotton canvas or with our specialty, which is polyester Dacron.